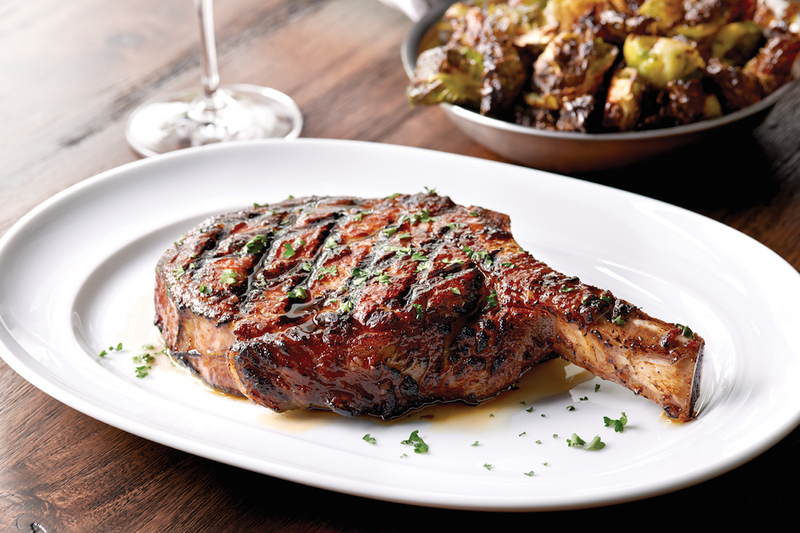 Toss a T-bone in any direction around Rockefeller Center and you'll likely hit a steakhouse. Toss a T-bone in any direction around Rockefeller Center and you'll likely hit a steakhouse: Quality Meats, Strip House, Hunt & Fish Club, Ruth's Chris, Empire Steakhouse, Morton's, Palm, Capital Grille, STK, Shula's, Bobby Van's, NYY Steak, Bull & Bear, Michael Jordan, Del Frisco's, Del Frisco's Grill, all smack in midtown, all with more or less the same menu, the same prices for steaks and chops, and, increasingly, cordial service designed to make regulars of consumers who have an embarrassment of choices in the matter. 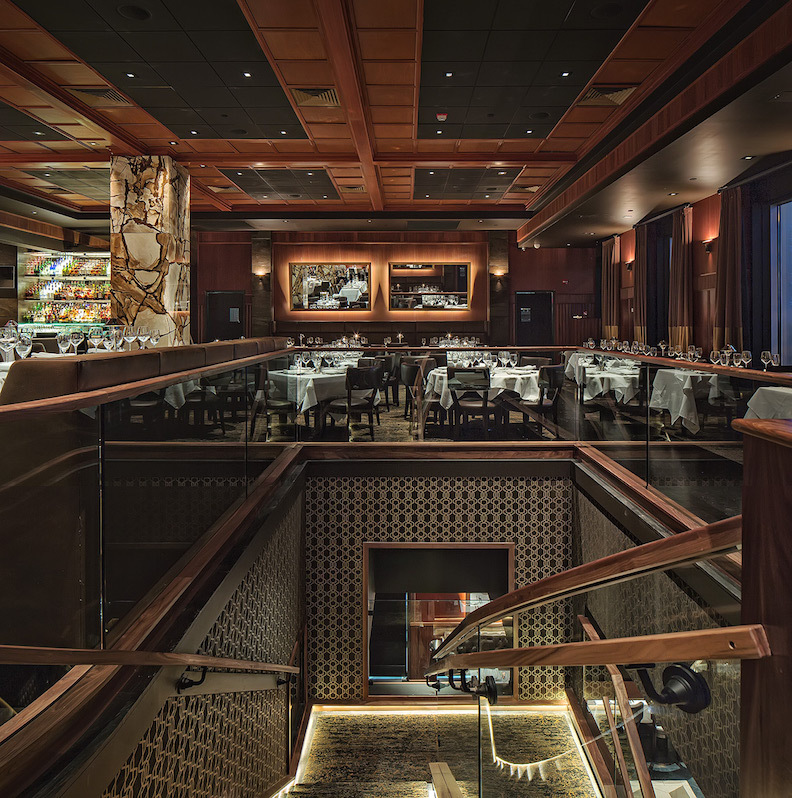 Most are either local or national chains, which depend on the loyalty of patrons faithful to the original Ruth's Chris in New Orleans or the Shula's in Coral Gables who will search out their branches in other cities. 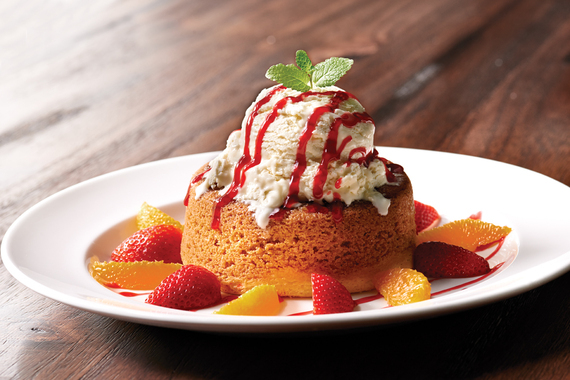 The newest entry, replacing a McCormick & Schmicks, is Mastro's, part of a 12-link chain that began in Scottsdale, Arizona, and now has branches in California, Illinois, and Nevada; this is the first one to open on the East Coast (last November), with DC to debut this month. All have the same menu and all offer live and canned music played at an extremely high decibel level; décors differ from city to city. The décor in NYC is swanky, low-lighted, set on two levels, which its website insists was chosen to represent "the authenticity of New York City," with bars made of bronze satin quartzite, dark mahogany woodwork, stained wood flooring, marble columns, and trompe l'oeil patterns set within the floors and walls. I'm not sure what's so authentic about such design elements, but it makes for a good-looking space with lots of polish, and for a restaurant open for short a time, its management and wait staff are pros, many of them veterans of other steakhouses in town. The spacious tables are set with two tablecloths, which soak up some of the noise, but it is extremely difficult to have a conversation owing to the loudness of the thumping music upstairs; those who complain are offered the option to dine in the dreary downstairs section, usually used for private parties. I did ask for the music to be turned down and the manager graciously did so. Black napkins are offered for those in dark clothes. Plates come out nice and hot. Oversized wine glasses, by comparison with many competitors', could be of better quality. 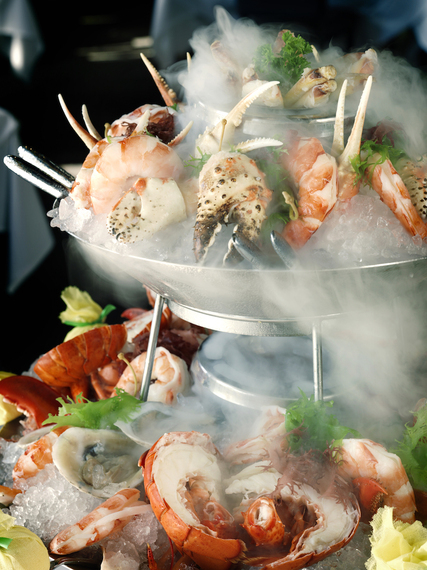 The two-foot-tall tower of seafood is impressive, not least for the dramatic billowing mist of dry ice pouring out of it. The menu invites you to "create your own selection" of seafood on the tower, but our table left it to the waiter to decide. What arrived was an abundant display of jumbo shrimp, crab, lobster, crab legs and oysters. But be aware you will be charged by the selection, so that the price can soar, with crab cocktail $28, crab legs $34, and lobster cocktail $35. Ours, for four people, came to an eyebrow-raising $207. All of the steak cuts we tried were first-rate. All, except an 8-ounce Japanese wagyu strip ($145), were USDA Prime: bone-in 18-ounce Kansas City strip ($58) and bone-in 22-ounce ribeye ($59), all sliced and deftly portioned out at the table. Prices are comparable to other steakhouses in the neighborhood. Mastro's also serves whole lobsters from two to four pounds. We ordered the latter, and I asked, if they were going to crack the shells and remove the meat, that it be done when all the other entrees arrived so that the lobster would not get cold. Our waiter said he would do the job at our table but instead a plate of lobster meat only was placed before us, and, from the size of the claw and tail meat, it didn't seem that this began as a four-pounder. Neither were the carcass, walking legs or uropods of the tail on the plate--many people do enjoy the tomalley and all the rest--and, at a whopping $140, this was a disappointment. Creamed spinach ($14) and an impeccably cooked, split and buttered one-pound Idaho potato ($13) were delicious. The signature butter cake ($16) was a triumph of decadent goodness, the chocolate sin cake ($10) was thick and fudgy, but in the city that invented the Italian and Jewish-style cheesecakes, Mastro's ($11) needs a lot of work: it was gummy and dry. The wine list is impressive, if top-heavy in bottlings well above $100, and mark-ups are high, as they are for cocktails like the $20 martini and $14 Sambuca, which are even higher than they charge at a nightclub venue like Tao. There is a lot to applaud about the food and service at Mastro's--VIP host Victoria Hunt is only too happy to add you to her list--and, if you don't mind spending a lot of money and the cacophony (here it's called "excitement") of the music, they may win you over to their style, which is more Scottsdale or Vegas than it is New York, where the rubrics of the steakhouse were set decades ago. Mastro's is open for lunch Mon.-Fri.; dinner nightly.